People ask me all the time, “What food do you recommend?” I started researching dog food and looking at the first few ingredients, as they are the most important, and meat should always be the first one. The guaranteed analysis was the next important criteria. I tried many formulas recommended by several vets and none of them worked well for all the dogs and puppies. It seemed I needed so many foods to suit all my needs, and then I used Life’s abundance. I was so impressed by the quality and high standards of the food and the amazing testimonials from the customers and field representatives of the company that I decided to switch to the Life’s Abundance Nutritional System. 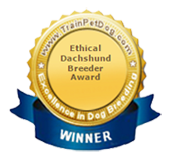 Our missions at Heartfelt Dachshunds are to provide a loving animal with the best temperament possible along with the quality and best bloodlines possible to have beautiful, healthy companions that will be enjoyed for many long years to come. Life’s Abundance was created to provide our companion animals with a nutritional advantage. Life’s abundance Premium Health Food for Puppies and Adult Dogs is made with select ingredients to help your dog achieve and maintain optimum health. 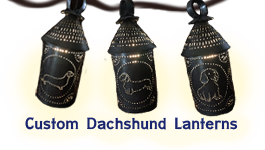 This Line of products was created by Dr. Jane Bicks, DVM. She has been a holistic vet for over 20 years. She has served as President of the American Veterinarian Association of New York City, earned three Presidential Citations, appointed by Mayor Rudolph Guliano to help establish one of the largest animal shelters in the world, the author of three books on responsible care and treatment of pets, and has appeared on 48 hours, Good Morning America, CNN, Discovery channel, Animal Planet, and more. 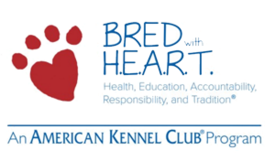 She has also created a non-profit foundation where a percent of the profits is contributed toward rescue and care for pets. While it is true that dog food started around World War ll consisting of leftover grains and meat that were rejected for human consumption, it was recognized that the food was not providing adequate nutrition and dead, diseased, dying, drugged animals were fitting the criteria for being used in the food. Our pets can genetically live to be 20 years old but the current average is only 13 -15 years due to environment, health care, and nutrition as one of the most important factors. Many of the ingredients in our pet food today cause a shorter life span due to stress on the kidney and liver functions which include wheat, corn and soy. These are also major allergens to our pets. By-products such as chicken heads, duck bills, fish heads, chicken and turkey feet, bones and diseased and contaminated slaughterhouse meat can also be included in our pet foods! BHA, BHT, which harms our dogs liver and kidneys are also known as carcinogens. Ethoxyquin, which is used to stabilize rubber and other chemicals are added to provide a longer shelf life for months or even years. Life’s Abundance Nutritional System consist of the food and the wellness supplement for puppies and adult dogs of all breeds and sizes. The delicious recipe features an antioxidant system to support dogs throughout their life cycle. The prominent fatty acids promote a healthy skin and a glossy coat as well as complex carbohydrates from oats for sustained energy. Another highlight of the food is its proprietary blend of of vitamins and minerals to supply dogs with the nutrients that help them to thrive regardless of their age. The Life’s abundance recipe furnishes the body with optimal protein levels to help puppies grown strong and adults to maintain muscle mass. Additionally we have added a balanced blend of calcium and phosphorous to support both developing and aging bones. Our naturally –flavored kibble comes complete with dietary fiber and probiotics to promote digestive health. Because we use only wholesome ingredients, it contains no artificial colors, flavors, corn, wheat or glutens. It is nutritionally dense which means that you won’t have to feed your dog as much food as other brands and that translates to savings you can count on meal after meal and less mess to clean up outside as well. IT IS WHAT A PET FOOD SHOULD BE. 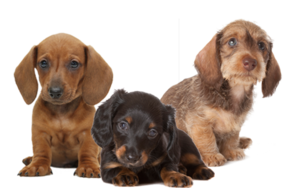 Our puppies begin eating Life’s abundance food mixed with warm water and gradually by the age of 8 weeks of age, get ready to go home on the dry food. We do love the pork and venison canned food for some of the picky early eaters. We believe it is crucial for your puppy to continue taking the life’s abundance nutritional system through their lifetime. At any time if your pet is removed from the food and supplements, their health guarantee will become null and void. ORDER Life’s Abundance Nutritional System at http://ourhealthypetchallenge.net/ or call 1877-387-4564 and tell them your sponsor or rep is Lynda Carter # 20071837. It is important that you use that link or let them know when you call to order so I can track the order for your health guarantee. We hope you will enjoy the puppy for years to come. 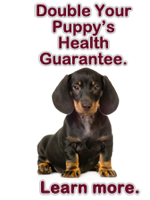 We have taken steps to ensure that your new puppy is healthy and happy and we are putting our best guarantee ever to ensure that you will have a healthy pet. We are stepping up our one year guarantee as it is on our contract to a full 5 years Health Guarantee for all customers who use the food and nutritional supplement. This includes customers who have previously purchased a dog from us and have no lapse in their use of the Life’s Abundance Nutritional System which includes the food and supplement.